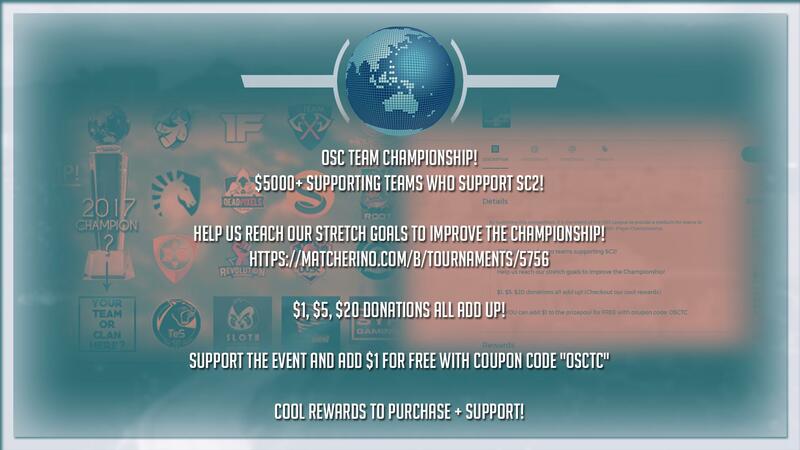 $5,000+ directly to teams supporting SC2! Who will be team of the year? 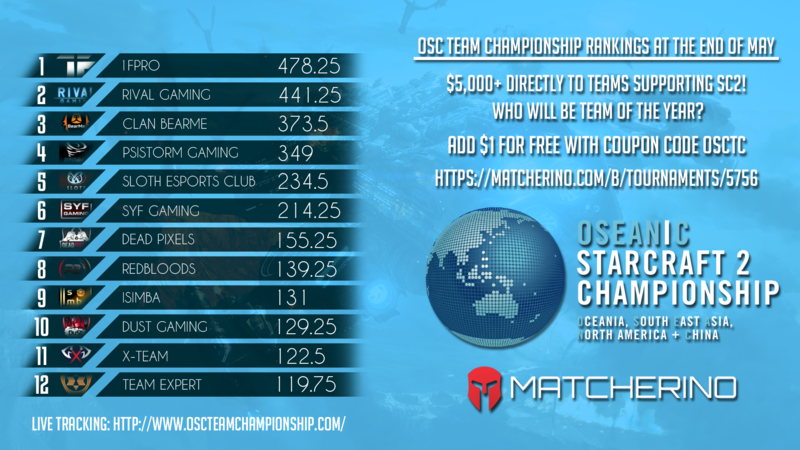 By launching this competition, it is the intent of the OSC League to provide a medium for teams to compete with one another, in parallel with our $200,000+ Player Championship. 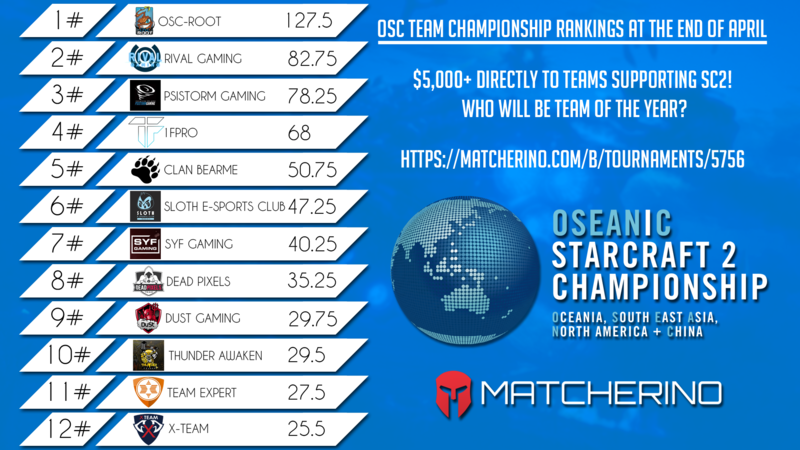 This Team Championship will use player performance in existent OSC Partnered events to provide additional incentives to players, teams, events and sponsors, as well as creating a more involved storyline for the viewer/fans. Now, as a player progresses through an OSC partnered tournament for personal financial gain, improved position in the World Rankings, and the chance at qualifying for the Player Championship at the end of the year, they also accumulate points for their organisation in the Team Rankings! As mentioned, we are running this Championship through Matcherino, meaning we can utalise crowd funding to increase the prizepool of the tournament! We have some great donation goal rewards, which should act to encourage contributions, and provide entertainment to those who help support this project and goal of helping teams supporting SC2! MORE INFO HERE! How it will work, Who can join, Where to find results, Why is OSC running a team league, etc. Last edited by Eddie; Wed, 15th-Nov-2017 at 1:31 PM. 16 Teams/Clans signed up so far! All funds raised go to teams supporting SC2! Last edited by Eddie; Sun, 23rd-Apr-2017 at 11:31 AM. Here are the Rankings at the end of April! You can help support the event on Matcherino Here. We've added some stretch goals, including running a $500+ Playoff/Finals for the top 12 teams! We think it's quite an achievable target, so let's make it happen! We have a new round of FREE $1 Coupons you can use to support the Championship! "OSCTC"
Plus we've added some cool rewards! Here are the Rankings at the end of July!